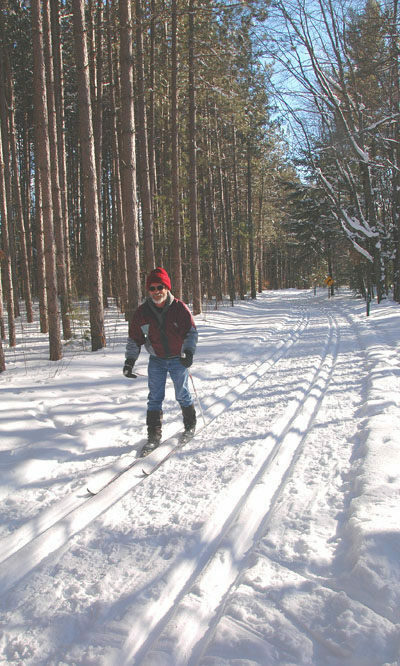 There is great cross-country skiing all around the city of Gaylord and right in the middle of it as well. Aspen Park is a 100-acre city of Gaylord park whose rolling terrain of hardwoods and hemlocks is only four blocks from a K-Mart in the heart of town. Its Northwoods setting is even more produced because the park is adjacent to the city elk pen, a 105-acre enclosure that contains a herd of more than three dozen animals. 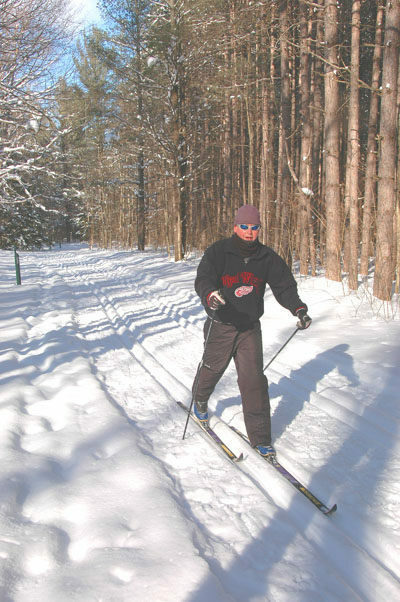 Winding through the park are five paved trails that total 2 miles and are groomed for classic Nordic skiing. Even better they’re lit with the trailside lights popping on at 6 a.m. until daylight and again at dusk until 11 p.m.
Night skiing is some of the best entertainment Gaylord has to offer in the winter. You stride to lights that illuminate the tracks and cast a soft glow into the dark woods. Afterwards you can head over to the Big Buck Brewery, a mere five minutes away, to quench your thirst with a microbrew. The outside perimeter of the paved paths is a 1.65-mile loop. 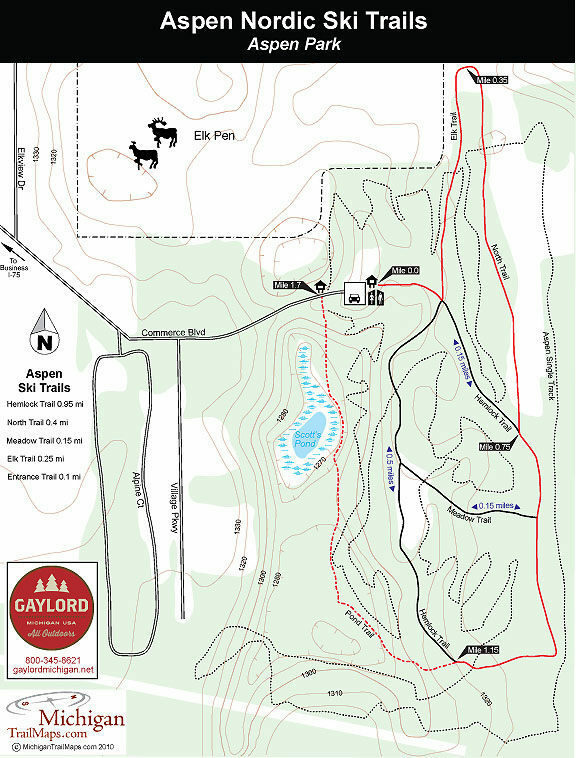 The ski described below is a slight variation that includes Pond Trail, making it a 1.7-mile loop. Pond Trail is not lit nor is it groomed. But it is one of the most scenic stretches of trail at Aspen Park and offers the only real change of elevation in the system. For these reasons enough skiers include it on their run that you are rarely breaking trail or setting tracks. There is no direction of travel at Aspen Park although the majority of skiers seem to follow it in a clockwise direction. From the parking lot trailhead you enter the woods and begin with a gentle descent to a major four-way junction with Hemlock and Elk trails where there is a bench and a posted map. Head north (left) to follow Elk Trail through the woods and then into an open field where you stride past the city’s Elk Pen. See any elk? At Mile 0.35 Elk Trail passes one of two mini-shelters in the park and then swings south to become North Trail. You enjoy a mix of fields and then woods before arriving at the junction with Hemlock Trail at Mile 0.75. Continue south (left) to follow Hemlock Trail along a level route that passes some impressive hemlocks. At Mile 1.1 Hemlock begins to curve back north while Pond Trail continues west where it’s descends 40 feet before bottoming out. The trail swings north and skirts scenic Scott’s Pond before climbing to the higher elevation of the trailhead gate on Commerce Boulevard, reached at Mile 1.7. The Aspen parking lot is just to the east (left). Aspen park is open for skiing from 6 a.m. to 11 p.m. with the trails lights on from 6-8 a.m. and 5-11 p.m. There are fees to ski.